These rare and beautiful birds are highly prized for exhibition purposes and for their valuable plumage which is ideal for fly tying. 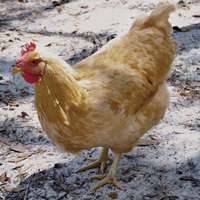 Our Buff Rocks (Plymouth Rocks) are truly gorgeous — pure golden buff from feather base to tip. These birds are fine winter brown egg layers and good late Spring setters. 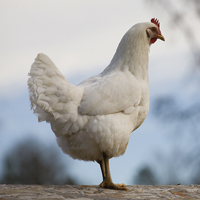 Our White Rock pullets are outstanding for egg production the entire year, and are especially desirable through the cold winter months when lighter breeds slack off. They lay a brown egg of fine quality and size. This is one of the best varieties for the exhibitor as it is quite rare and makes an outstanding show bird. The highly colored male has black hackle and saddle feathers with an edging of rich brilliant red, a lustrous greenish black breast and body touched with reddish bay on the wings.